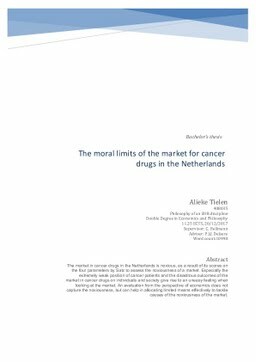 The market in cancer drugs in the Netherlands is noxious, as a result of its scores on the four parameters by Satz to assess the noxiousness of a market. Especially the extremely weak position of cancer patients and the disastrous outcomes of the market in cancer drugs on individuals and society give rise to an uneasy feeling when looking at the market. An evaluation from the perspective of economics does not capture the noxiousness, but can help in allocating limited means effectively to tackle causes of the noxiousness of the market.